I recently took on a project where I needed to graph some data on a webpage using data I had queried from a database. Since I love Python, I decided to use it to accomplish this task. 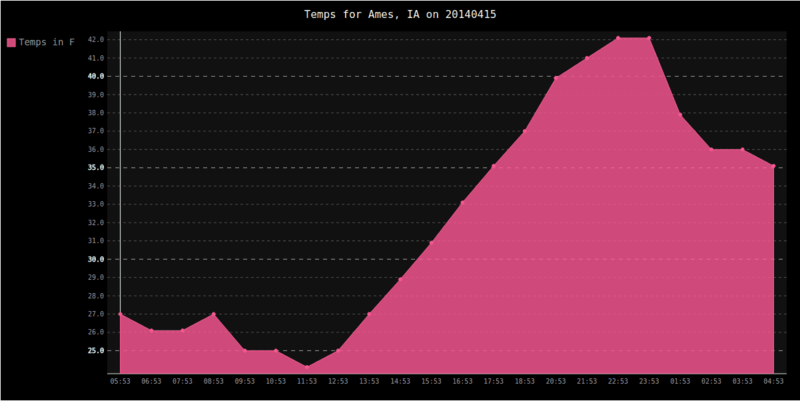 I went with Flask for serving the webpage and pygal for creating the graphs. In this tutorial, I will show you how to do that too, but without the database logic. Instead, we’ll get weather data from the Weather Underground and graph that. Let’s get started! If you don’t want to install Flask and all its dependencies onto your system Python, you should create a virtualenv, activate it and install these packages there. Let’s break this down a bit. The main part we want to look at is the get_weather_data function. It has a decorator @app.route(‘/’) that tells Flask to call this function if we go to the home page of the website. The home page in this case would be http://localhost:5000/. Next we have our Weather Underground API key and the URL we want to use. In this case, I am grabbing historical data. You can use a slightly different URL to query for current weather. After that, we open our URL, read it and parse the JSON it returns. Finally we pull out the temperatures in Imperial format along with the hours of the day that they were recorded. Now that we have our data, we can create our graph! We’ll start by creating a bar chart. Here I set the size of the bar chart as otherwise it will end up being quite large. Then we set its X labels and add the data to the chart. Finally we create the HTML to display and call Pygal’s render method, which returns an SVG in XML. You can call other rendering methods that will return other types too. You will note that we imported the render_template function and that we use that to load the template. We also need to tell PyGal to disable xml declaration. If we don’t, then we’ll get some unicode decoding errors. Anyway, give this code a try and you should have the same graph as before. 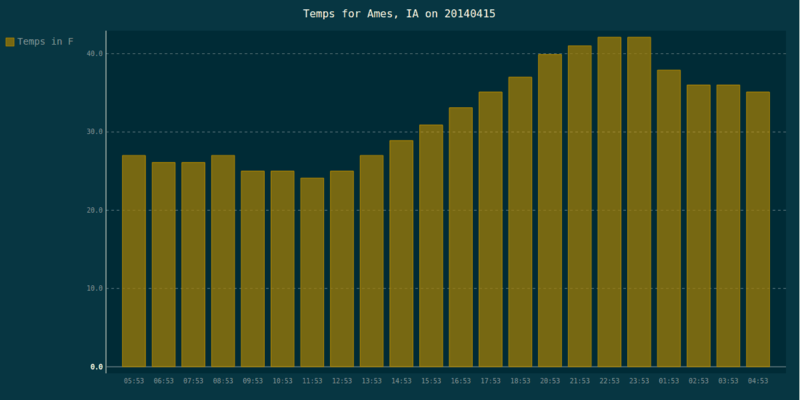 At this point, you should be able to create your own graphs using Flask and Pygal. I recommend checking out Pygal’s documentation so you can see the many other types of graphs it can do. It also has a lot of fun styles that you can apply to your graphs. You will also want to check out Flask’s documentation to learn how to add CSS and other niceties. Have fun!